I still find it hard to believe I received a cancer diagnosis almost a year ago. The tumor that was discovered in the stomach was surgically removed last May and there are no signs of any return of the disease though I suppose you’re never really certain enough to declare victory over such a thing, pretty much ever. One of the courses of treatment you take to prevent the return of cancer via the bloodstream is chemo therapy in pill form- a much more civilized, seriously less horrible alternative than the kind of chemo you get intravenously. 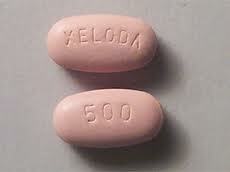 It’s called Xeloda and it’s a rather amazing drug. When used to actually attack tumors, it has an excellent track record of shrinking if not annihilating them. And for preventive purposes, as I used them, there is strong statistical evidence they do the job as well. They are no picnic. Extreme fatigue is one of the effects, along with nausea and uncomfortable things that can happen to your hands and feet. I started taking them July 1st and they gave me weekends off to recover. I take the last of the pills tonight and I’m done which is worth celebrating- but also kind of scary. As long as you take them, you feel like you’re doing something proactively to keep cancer from coming back. When you’re done with them, it is apparently quite normal to feel like you’re operating without a safety net. Except you‘re not. My doctors at Georgetown tell me there is new research that indicates that minimal, regular exercise, to the tune of 45 minutes a day of even casual walking, has just as strong a statistical correlation for cancer prevention as chemo-therapy. About a week after they told me this, there it was in the Washington Post- same research-same conclusion. This is good news for me as I don’t own a car and I actually already walk 36 minutes a day back and forth to the subway. Hopefully, the weekends I was using to physically recover from the effects of the chemo drugs will now be filled with more energy and a little less couch potato action. This is the last time I intend to blog about this whole thing. It was, honestly, very helpful to me to write about this journey from fear to good health. It’s been a long path, but one that need not be revisited. I continue to be incredibly grateful to my friends, family and colleagues for the tremendous support, love and prayers, all of which worked remarkably well. Thank you all. And now on to the business of living. So glad for you, Robert. Keep moving. My mother died of cancer 37 years ago, when there were far fewer options than there are today … Thank you doctors and scientists for never giving up in your search for a cure. Thank you Robert for sharing your moving story. May you stay in the best of health. I’d like to walk with you to the subway one day… In solidarity. I never take alcohol, which I gave up after years of being a card-carrying drunk, one day at a time – I was lucky enough to conquer it (finally) and move on. But cancer, for which I have undergone treatment and am currently “cancer free,” is another story. Booze I have some control over; cancer pretty much has the control over me. I do not feel powerless over alcohol (and disagree with that AA/12-Step mantra and philosophy). I cannot say the same for cancer.